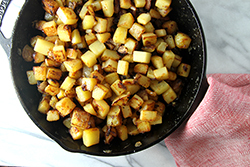 Homemade breakfast potatoes are easier to make than you might think! Partially prepare the potatoes the day before by parboiling them until barely tender. In the morning, breakfast will come together with ease. While pan-fried potatoes are delicious on their own with a little salt and pepper, we love loading our breakfast potatoes with an array of tasty garnishes. In fact, adding a few fried eggs on top make it an entire hearty breakfast! 1. In a large pot of salted boiling water, parboil the whole potatoes until just cooked, barely tender to the tip of a knife, about 15 minutes though this varies based on the size of the potatoes. Drain the potatoes and cool. At this stage, the potatoes may be refrigerated for up to three days. 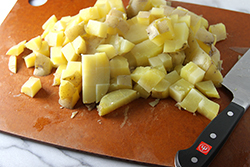 When ready for the final preparation steps, dice the potatoes into 1/2-inch cubes. 2. 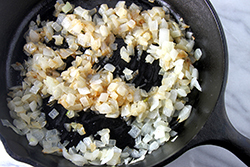 Heat the butter in a large skillet, and sauté the diced onions for about 4 minutes. Add the diced potatoes and cook on medium-high heat, gently tossing until browned on all sides. Take care to not smash potatoes, but instead lifting and flipping carefully with a turner. 3. Season the potatoes to taste with salt and freshly ground pepper. 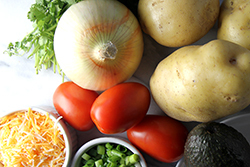 Top the browned potatoes with an array of garnishes including diced tomatoes, shredded cheese, minced cilantro, sliced scallions, and avocado. 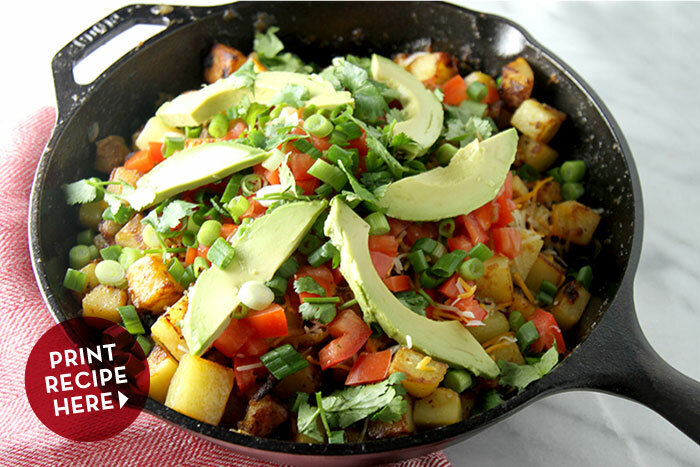 Serve right in the skillet – it will help keep the potatoes piping hot!